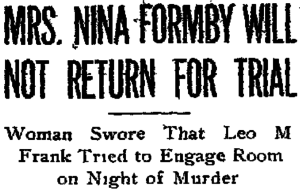 Mrs. Nina Formby, who signed an affidavit in the Frank case in which she swore the superintendent has endeavored to engage a room at her house, 400 Piedmont avenue, during the Phagan murder night to which he might bring a girl has fled to Chattanooga and will not appear at the coming trial on July 28. This announcement was made to a Constitution reporter last night by the woman’s legal representative, John Gossett. Gossett states that she is fearful of facing cross examination on some phases of her story. A letter has been placed on file in Gossett’s office in which the Formby woman asks for a continuance of a trial in which she will be arraigned before a justice court. August or September are the months to which she asks the case be put. The letter says that she will not be in Atlanta until that time. She has obtained a position in the Tennessee city, she says, and intends making Chattanooga her future home. At first it was intimated that the state would put credence in the affidavit, but on account of the woman’s character it was later considered of but little value.